Ok, just have to do a quick post on this cake as it was SO fun to do. Maria (she’s the greatest!) ordered it for her godson’s birthday, and I was so excited to do it for her…Realistic food cakes fascinate me (I’m a detail person), so this one was super cool! I wish I would have taken more shots of the construction and detail steps (just so I can do it again if needed), but I didn’t, sorry :(. I started with a 12×12 square chocolate cake, cut in half and stacked (with caramel turtle filling) and carved it into a burrito shape. After rough-icing the carved cake with vanilla buttercream, I chilled it for an hour or so and then covered it with ivory-colored fondant fashioned to look like a tortilla. Diluted brown food color painted on the outside made it look toasted. Wrapping the bottom half with foil made it look even more realistic. The food details (rice, beans, lettuce, tomatoes, cheese, chips) are made from homemade marshmallow fondant (check out this video from the Artisan Cake Company to see how it’s done) and the guac and sour cream are green and white buttercream. Hope you were surprised with your burrito cake, Antoni, it was sure fun to make! Ok, so I love these water color cakes and am excited whenever someone orders one because they are so fun to do. The other neat thing is that they are so unique…just like the person I’m making them for. No 2 cakes are the same. I’ve had the privilege of making beautiful Audrey’s birthday cakes for a few years now and it seems that she always has a specific design in mind. Colors, look, style, everything….which is fantastic for someone so young. She knows exactly what she wants and it always looks great. This one is a 5″ and 7″ 2-tiered cake with chocolate cake and marshmallow cream filling. The water color icing is turquoise, silver and white. And she wanted a silver fondant “15” on top. The silver and black plaque and name are also made from fondant. I loved the way it turned out, classic and unique–just like Audrey. Hope you had a very special 15th birthday, Audrey, I loved making your cake! I had the privilege of creating this cake for a nice young man who had recently graduated from a local high school. This 2-tiered cake has an 9″ chocolate tier and a 6″ confetti tier iced with vanilla buttercream. I used homemade marshmallow fondant for the name plates and a topped it with plastic grad cap and paper “scroll” I bought online. It’s always so nice to see the cakes with their intended recipients. Loved doing this cute Sesame Street birthday cake for Reid! It started out as a 3-tiered cake, but Reid’s mom decided that 2-tier was large enough and I added the sign on top to give it that extra needed height. The bottom 10″-tier is chocolate with cookies and cream filling and the 8″-tier is snickerdoodle cake with cinnamon buttercream between the layers. The cake was smooth iced with buttercream and the details and images were all hand-cut from homemade marshmallow fondant. Reid’s mom specifically wanted Elmo and the Cookie Monster to adorn his cake. I loved the little details of the stars on wires, the tiny letters cut from fondant, and the multi-colored stripes….so festive and happy. The cake just screams “HAPPY BIRTHDAY!” don’t ya think? I was really pleased with how they turned out. This was SUCH a fun cake with so many cute details. Hope you had a great 2nd birthday, Reid (and thanks for asking me to make it for him, Candee :0)! I’ve made quite a few non-character, non-themed birthday cakes over the past few weeks. Just simple, happy, feel good celebrations cakes. They are decadent, delicious, and not ones you’d typically make for yourself…or get at a bakery or grocery store. They’re one-of-a-kind unique and made just for that special birthday person. I love doing these cakes, because it kind of lets me create what I’d like brought to the table on my own birthday. This one is a version of the raspberry almond cake I posted a few weeks ago, only I added colored sequins on top for some color. It’s an 8″ sour cream almond cake with raspberry filling and vanilla buttercream. 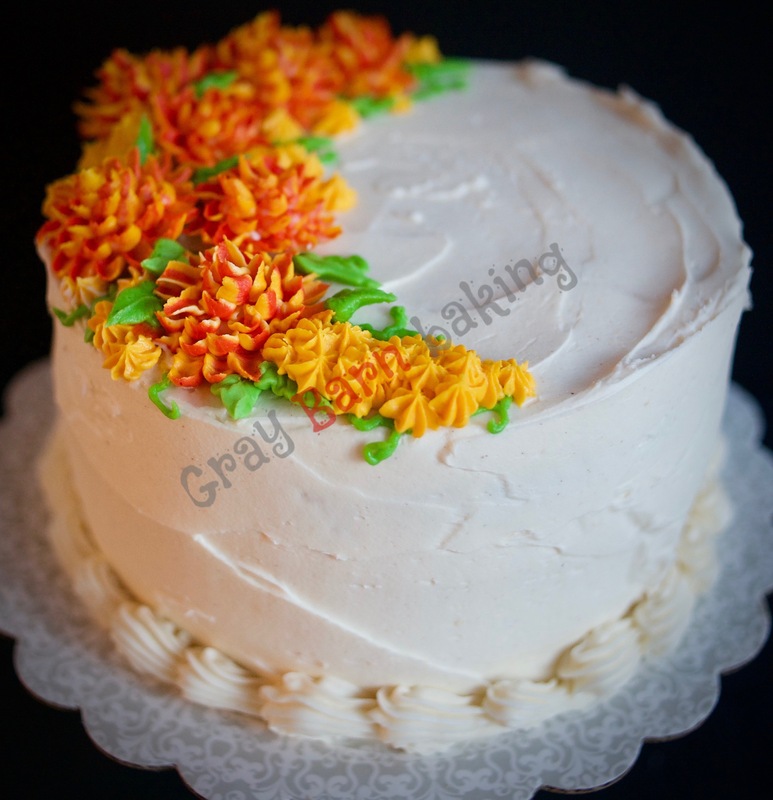 For this one, the birthday girl wanted rustic icing and fall-colored buttercream flowers. I used a special petal tip and variegated icing to pipe the mums on pieces of parchment paper, then popped them into the freezer to firm up before adding them to the cake. Then I filled in with a star tip for the yellow flowers and leaves. And then there is the humble-but-oh-so-yummy chocolate cake with whipped ganache icing and multi-colored sequins…mmmmmm.